Choosing the right Rise and Recline chair is important if you are to avoid wasting your money. Rise and Recline chairs are designed not only to help you put your feet up, recline gently for a snooze but they also raise up to assist you in getting out of the chair. Rise and Recline chairs start as low as £425 in our shop up to over £1000 and so it is important to make the right decision. Care100 has it’s own criteria for supplying rise and recline chairs and if you follow this advice, your purchase should be suited to your needs and will provide many comfortable hours. If you are buying a rise and recline chair for someone who is unable to visit the shop, any reputable supplier should be able to show you how to take accurate measurements to ensure a comfortable fit. 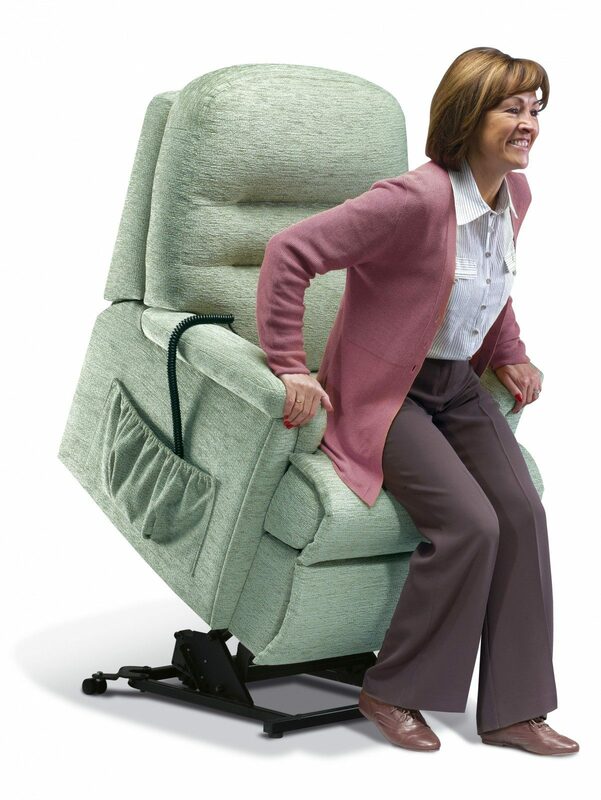 A single motor will lift your feet up and then gently recline the back. On a chair with a dual motor, the footrest and the back are operated by 2 different motors and will give you more choices of sitting positions. The dual motor chairs also recline much further and may be more suitable for someone who sleeps in the chair. However, the single motor chairs usually only have 2 buttons (up and down) and the dual motor can have 4 or 5 buttons. Consider carefully the person who will be using the chair. Would it be easier for them with only a choice of ‘up’ and ‘down’ or will they manage 5 buttons? The chair will need an electrical socket (without trailing wires across the room) and also space for the chair to recline. The chair must not touch the wall as it is reclining as this will burn the motor out. Always check the measurement of the chair you are considering to see if it will fit into the allocated space. If there is not enough room for the chair to recline, ask about a wallhugger. These can usually be placed within 6 or 8 inches of the wall as the mechanism is slightly different. Kate and Gill have a wide selection of rise and recline chairs in their showroom. They offer expert advice and fast delivery of your chosen chair. Customers are welcome to come and try the chairs for as long as they like. If you are buying a chair for someone who is unable to come to the shop, Kate and Gill will come to your house to get the correct measurements and advise on the chairs available. This entry was posted in Choosing the correct rise and recline chair and tagged carer, recline, rise. Mobility Scams – What you need to know!!! !